Thanks to my dear friend Pinterest and lack of extra cash, I am super inspired to have a DIY Christmas this year. It is Andrew and I’s first Christmas as a married couple, although we’ve been lucky to spend the last two Christmas’s together. This year is even more special because it’s the first Christmas that I get to host in our home! Only problem is, the amount of Christmas decor I have could fit inside a shoe box. Ok, I have a little more than that… but not really. Of course I know that Christmas is not about the decorations and frills, but I really do love Christmas decor. I haven’t really decorated for any other holiday this year, besides a few Easter candies and a pumpkin. I’ve been saving all my energy and ideas for December. If you check out my Pinterest Holiday board, you’ll see I have a lot of dreams. As some of you can identify with, DIY doesn’t always mean cheaper. Luckily for me, I’ve been DIYing for many years here and there, so I have a pretty good supply of… supplies. So, here I was… browsing around Pinterest, when I came across this. Plus, with the no-sew instructions, it was great for me! 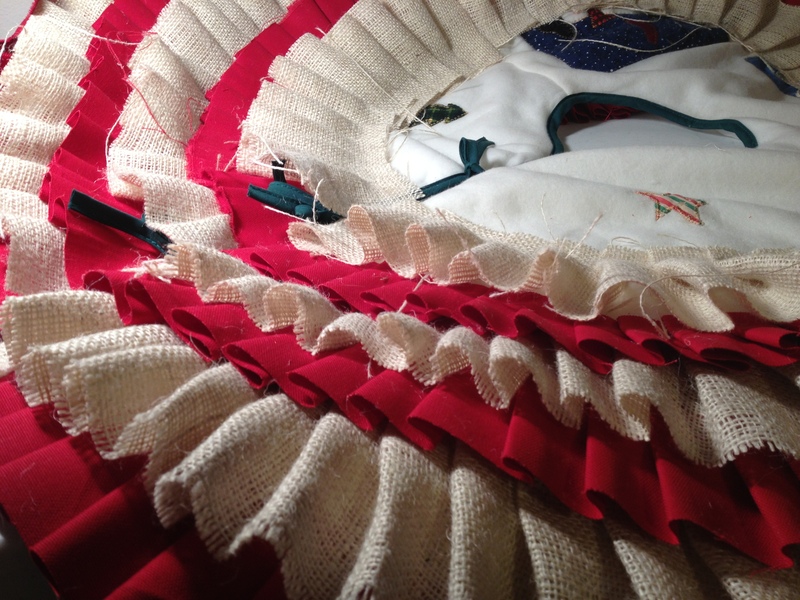 (Someday I will get a sewing machine…!) I had been debating for a while to sell my burlap aisle runner, or use it for projects.. Since it’s all the rage right now. I mean… 25 yards of burlap, I could do some damage with that. I decided to keep it, and turn it into decorations. 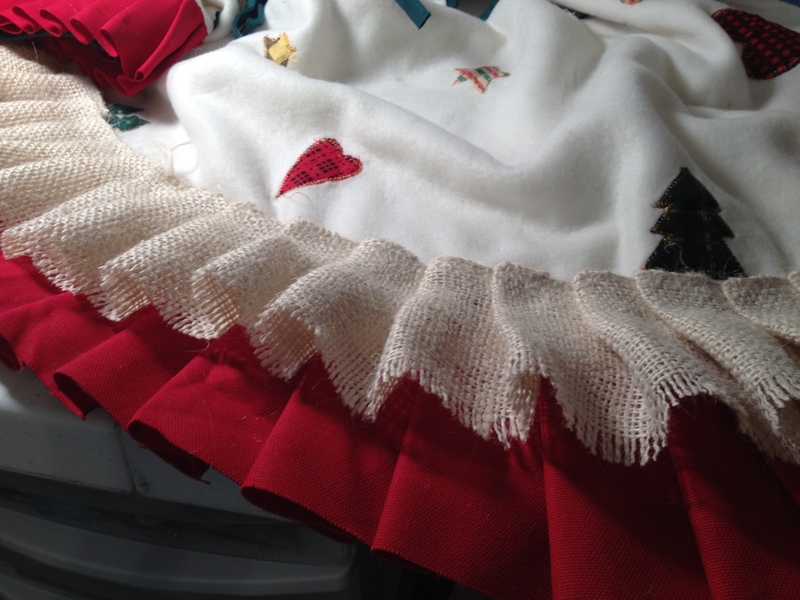 This tree skirt was my first Project. I’m going to see how much I can make out of this aisle runner. 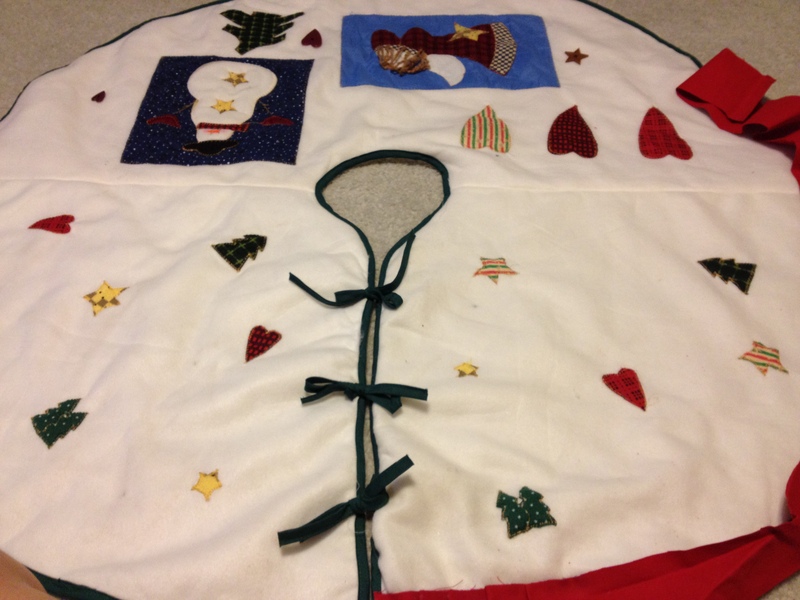 Here’s how the tree skirt turned out! 2 yards of different fabric, your choice! Time – this took me a few days, it’s very tedious. 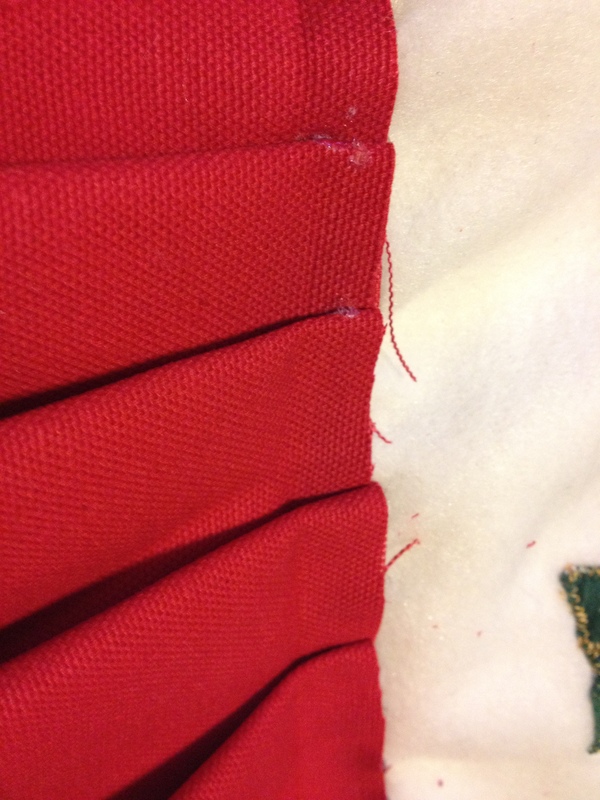 I cut the fabric into roughly 2-3 inch strips, the longest way possible. I found this at Goodwill for $3, it made a perfect pattern for the project! Simply hot glue a ruffle pattern, you’ll develop your own system as you go. I used a wine cork to serve as my finger for the burlap, since the glue comes right through.. You will burn yourself otherwise. You will probably burn yourself anyway, but less this way. 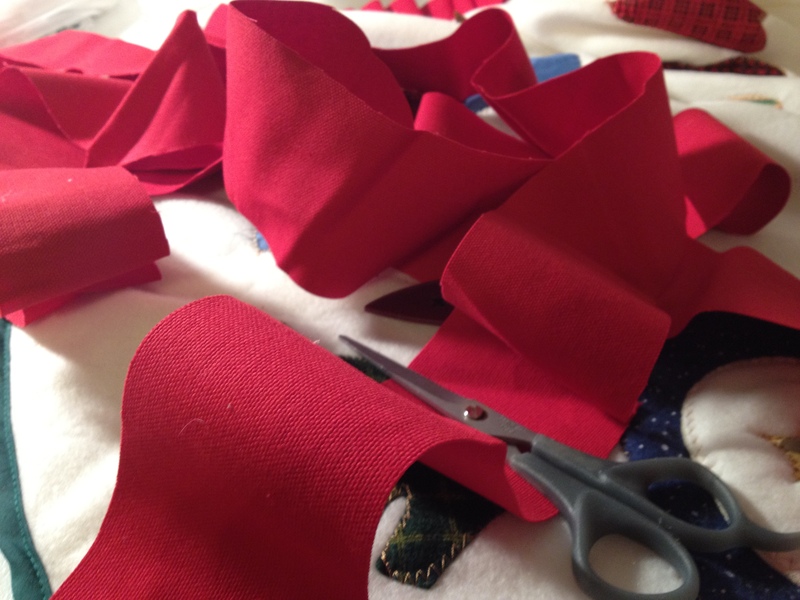 Making progress – When I was almost done, I realized I could rip the red fabric pretty easily for the strips…Which gave it a less defined edge, I liked it better. If I did it again I’d rip all the red. The finished product! 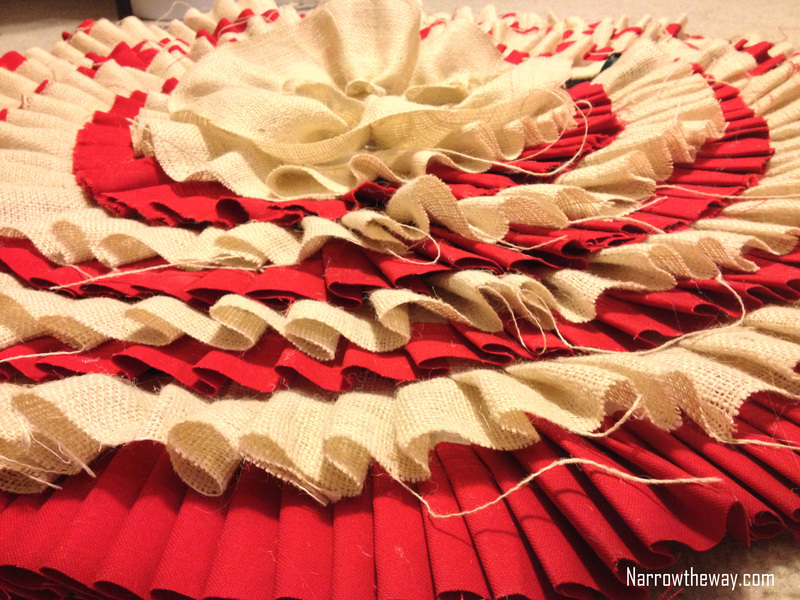 I wanted the inside lap to be a little higher, so I pulled a string in the burlap to ruche it around the small circle. That’s it! Pretty simple, I only burned myself once! Yeah! My next project is burlap stockings… I’d found some good pins for it, but most involve a sewing machine. I need to either figure it out with hot glue or hand sew them all. Check back to see how that works! I envision a post after Christmas entitled “100 things I made with my Burlap Aisle Runner”. ← It’s not Gringos Locos, but it’s close. Thanks Michelle! I’m really pleased with how it turned out, you never know with those pinterest projects! =) Thanks for the follow!